Our site at the Rohais has been in constant use as an ambulance station and training facility since the 1930’s. It provides a base of operations to the road ambulance service, cliff rescue teams, inshore rescue boats and our event first aid services. The site also hosts a training hall, administration offices, first aid room, meeting rooms, the Care in the Community Library and the St John Healthcare Shop. The training hall provides a large open space that our volunteers and staff can use to undertake various training activities and can also be split into two spaces for separate activities. There is a large, professional-standard kitchen attached to the hall and television and sound system for presentations with a smaller training/presentation room. Each Monday, Tuesday and Friday evening, the hall hosts our youth programmes (Badgers and Cadets) and training for our volunteer first aiders. Our training hall and kitchen are available for private bookings. Please contact us if you would like to book any of our facilities. The St John Care in the Community Library provides books to those in the community who are infirm and unable to visit a library themselves. 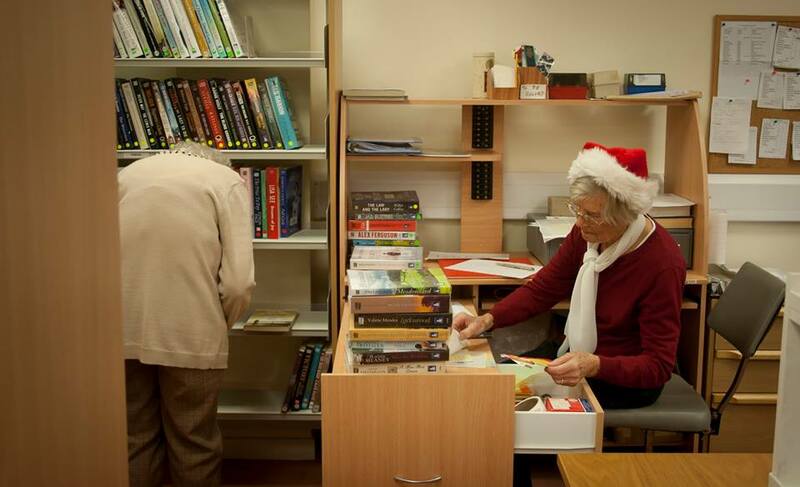 It provides easy access to large print books for the elderly or infirm as well as an opportunity for them to meet with volunteers and other library users. The library also provides its regular visitors with a great place to socialise. The library is open Tuesday afternoons and all are welcome. The St John Health Care Shop is a two-storey building located within the Rohais Ambulance Station site. The shop houses the largest range of equipment in the Channel Islands for people who are being cared for in the community or who have limited mobility. The shop supplies equipment to nursing homes and hospitals, as well as to community nurses and to individuals who may want a single item to help care for relatives at home. Visitors to the St John Shop will find a large showroom on the ground floor displaying a wide range of aids to assist those who have difficulty with simple tasks at home, such as specially designed cutlery and crockery for people with limited dexterity. A range of crutches, walking aids and wheelchairs is also on display. In addition to items which help disability there is also a comprehensive display of first aid kits and supplies. The shop staff will assemble first aid kits to suit any situation, whether a large office, a passenger-carrying ship or a personal kit for the home. Kits can be supplied to comply with legislation in any country. A service is offered where people can bring a first aid kit to the shop for checking so that used or out-of-date items can be replenished. A first floor also displays bedroom and bathroom aids including a hospital bed for hire or sale. There is an electric chair lift for disabled people to reach the upper floor which serves to show what help a lift can be in such circumstances. All of our commercial first aid and health & safety courses take place at our training centre at Les Cotils opposite Cambridge Park. It offers a large training room and excellent facilities to provide an effective learning environment for a variety of courses. In March 2015, St John, Guernsey Police and the Guernsey Fire & Rescue Service moved into a purpose built control room located at the islands police headquarters, capable of handling all incoming 999 calls, manage multi-agency responses and dispatch resources from all emergency services. All of the islands emergency services were involved in the project to set up a joint control room for handling all of the Bailiwicks’ 999 calls. Control room staff are able to answer any 999 call (previously each service answered its calls separately with their own dedicated control room staff) and despatch all of the necessary resources without needing to contact each separate control room for assistance. This has led to better response times and a more efficient handling of multi-agency 999 calls, such as traffic collisions or major incidents.